Mangrove wetland restoration and creation efforts are increasingly proposed as mechanisms to compensate for mangrove wetland losses. 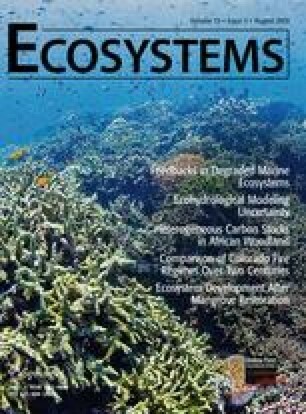 However, ecosystem development and functional equivalence in restored and created mangrove wetlands are poorly understood. We compared a 20-year chronosequence of created tidal wetland sites in Tampa Bay, Florida (USA) to natural reference mangrove wetlands. Across the chronosequence, our sites represent the succession from salt marsh to mangrove forest communities. Our results identify important soil and plant structural differences between the created and natural reference wetland sites; however, they also depict a positive developmental trajectory for the created wetland sites that reflects tightly coupled plant-soil development. Because upland soils and/or dredge spoils were used to create the new mangrove habitats, the soils at younger created sites and at lower depths (10–30 cm) had higher bulk densities, higher sand content, lower soil organic matter (SOM), lower total carbon (TC), and lower total nitrogen (TN) than did natural reference wetland soils. However, in the upper soil layer (0–10 cm), SOM, TC, and TN increased with created wetland site age simultaneously with mangrove forest growth. The rate of created wetland soil C accumulation was comparable to literature values for natural mangrove wetlands. Notably, the time to equivalence for the upper soil layer of created mangrove wetlands appears to be faster than for many other wetland ecosystem types. Collectively, our findings characterize the rate and trajectory of above- and below-ground changes associated with ecosystem development in created mangrove wetlands; this is valuable information for environmental managers planning to sustain existing mangrove wetlands or mitigate for mangrove wetland losses. All authors helped develop the study design. MJO, ACS, JAN, JML, AEA, PTH, KWK, FA, DDD, NC, and ASF performed the research. MJO analyzed the data and served as the primary author. All authors contributed to the writing of the paper. This research was completed with the tremendous support of many individuals and organizations. For their permission to conduct research on their lands, we thank the Environmental Protection Commission of Hillsborough County, Manatee County Natural Resources Department, Southwest Florida Water Management District, Tampa Bay Electric Company, Cockroach Bay Aquatic Preserve, and Terra Ceia Aquatic Preserve. For their logistical support, we thank Richard Sullivan, Max Dersch, Brandt Henningsen, Wendy Anastasio, Randy Runnels, and Ross Dickerson. We are very grateful to Montseratt Montero Fernandez, Rebecca Moss, David Boniche, Bernard Lilavois, John Dittmar, Jason Pietroski, Garrett Pangle, Coleen Elonen, Terri Jicha, and Heather Smith for their assistance in the laboratory and/or field. This manuscript was improved by comments from RR Lewis, KL McKee, the subject-matter editor, and two anonymous reviewers. The views expressed in this paper are those of the authors and do not necessarily reflect the views or policies of the U.S. Environmental Protection Agency. Any use of trade, product, or firm names is for descriptive purposes only and does not imply endorsement by the United States Government. Zhang Y, Huang G, Wang W, Chen L, Lin G. 2012. Interactions between mangroves and exotic Spartina in an anthropogenically-disturbed estuary in southern China. Ecology. doi:10.1890/11-1302.1.